I've avoided one topic ever since I started writing this blog, and even before. 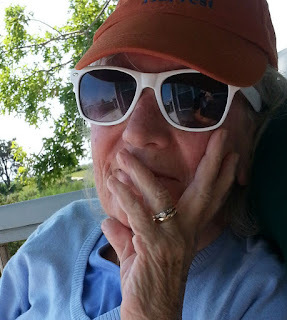 That's because whenever I think about Jeanne and our five-year toboggan ride with Alzheimer's, I like to remember the best moments, things we did right, and all that went well. We were fortunate in many ways, the most important being Jeanne's lifelong inner beauty. We also had resources - money, motivation, knowledge and understanding, friends, family, and a professional network to draw upon, along with a clear goal - for Jeanne to be safe, comfortable, and content in our home, where she could be dignified and loved. We were also successful, if that's the right word to use here. We achieved our goal. There were bumps along the way. Some aspects of Jeanne's clinical presentation were difficult, most notably complex partial seizures that resulted in several terrifying falls. The good news is that her neurologist was diligent and kept Jeanne's seizures under control, especially through our final year. Uncontrolled seizures - my worst fear. We lost a few friends - people who couldn't adjust to our new reality. But we also built an amazing team of people who more than understood: they helped us through it. The result: our ride ended without us smashing into a tree. We managed to stay on, and came to a quiet stop on flat ground. So, why bother about anything that didn't go well? My thoughts returned to something that went badly after Jeanne died when I read an amazing essay by Amy Cunningham, "Must it stay this dismal?" Amy is a funeral director who owns Fitting Tribute Funeral Services in New York City. Her mission - helping families face death, and bringing "more public scrutiny and awareness" to an industry that desperately needs change. I took on every aspect of Jeanne's care as her disease progressed, often as a caregiver, always as a care manager. I saw it as the best application of my education and experience. "Nobody knew her better or loved her more." Something to remember the next time someone tries telling you, "Stop being the nurse so you can be the (insert relationship here)!" I also took advantage of every available opportunity for help. But when I thought about "what to do" between the time Jeanne died and the time she was buried, I just couldn't contemplate the details, or even the general idea, of keeping her body at home. Jeanne provided some guidance at various times during our 40 years together. "Don't keep my body around," was one frequent instruction. "Don't spend a lot of money," was another. They would pick up Jeanne at some point following her death. Her body would be washed and dressed, though not embalmed, and kept for the day or two needed for a death certificate, burial permit, and having her grave opened at a green burial ground in Maine. I had already purchased the plot - two plots, actually. One was for Jeanne, and the other seemed like a good investment. It was an old joke between us. I had also purchased a linen shroud with an insert of dried Bay Laurel leaves, in keeping with the green burial aesthetic. I knew what I was going to do about flowers. We agreed that on the day of the burial, my daughter and I would come to the funeral home to wrap Jeanne in the shroud and place her into their discreet minivan. We would also drive her the 200+ miles to the burial ground, while the director and an assistant followed in another car. By my accounting, I would end up paying about half the median cost of a funeral and burial in Massachusetts. We only needed a few services, and I expected mileage to be the costliest. Another item checked off the morbid list. Summer passed into Fall, Halloween led to Christmas and the New Year. David Bowie died. Four days later in the early evening, Jeanne died. I called the funeral home.